Visit Skiathos Greece Skiathos Town. Skiathos Town enjoys a picturesque setting. 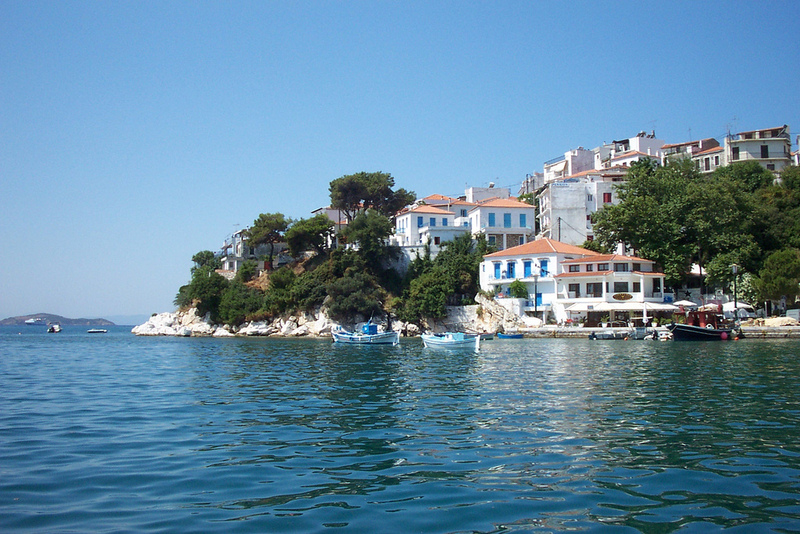 Skiathos Town is the capital of the island and is the hub of all activity. With its whitewashed Venetian style buildings clinging to the hillsides and two attractive harbours, Skiathos Town make a picturesque scene. The main traffic-free streets are lined with cafes, bars, restaurants and tavernas as well as boutiques and shops that sell all manner of goods. All of which conspires to give Skiathos Town a cosmopolitan air of sophisticated charm. Skiathos Town has two ports.The main port, to the north east, is utilised by the ferries and hydrofoils that call into Skiathos on their routes between the mainland and the other islands of the Sporades, including Skopelos and Alonnisos. The smaller, older port is situated to the south west and is used by local fishing craft, visiting yachts as well as a flotilla of pleasure boats. Here you can board a day trip that will take you around the island to see the many beaches that Skiathos has to offer. The two harbours are separated by a rocky peninsula known as the Bourtzi. This wooded area is a popular place to enjoy the views whilst being shielded from the heat of the sun. Skiathos Town offers a great night life. You are spoiled for choice for places to eat and there are night clubs and bars to suit all tastes. The highest point of Skiathos Town is marked by an old windmill that ha been converted into a restaurant. This is a very popular evening destination for many tourists and visitors to the island. Sitting outside in Skiathos Town enjoying the view over the harbours whilst watching the world stroll by can make for a very pleasant way to spend an evening. Skiathos Town also boasts a theatre that is based at the Bourtzi as well as an open-air cinema that shows the latest Hollywood releases. For those that like to dance the night away to the beat of the latest dance music, there are several night clubs located at the far eastern end of the harbour. Skiathos Town has a rich history and heritage having been occupied by several invading forces over the years. In fact at one point, the inhabitants surrendered the town and moved to the now abandoned area known as Kastro on the north coast. In more modern times, Skiathos Town has thrived having been designated a development zone for tourism by the Greek government since 1964. 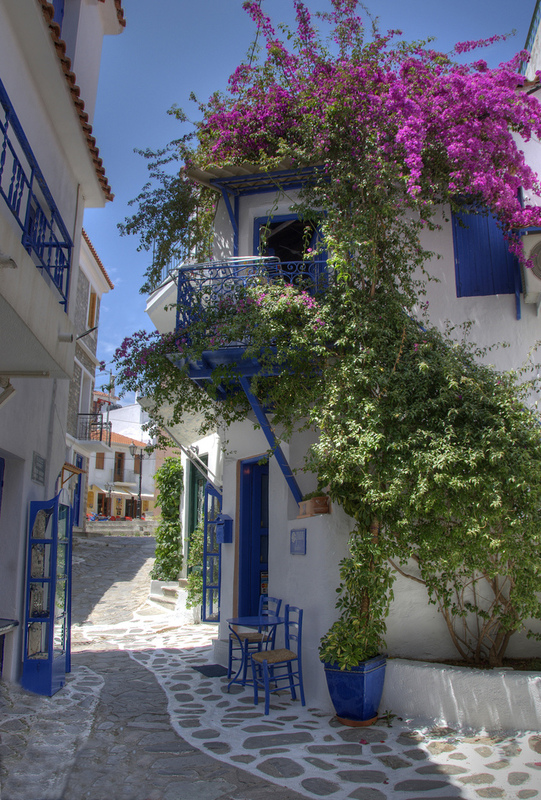 Charming streets meander through Skiathos Town. Skiathos Town offers a full range of shops and mini-markets that cater for every need. Tavernas, restaurants, bars and cafes are in plentiful supply. Accommodation options include: Hotels, rooms to rent, studios, maisonettes and private villas with pools. Many of these can be booked locally, though in high season it is best to book your accommodation prior to your arrival. Skiathos Town is the centre of the island's transport network. It is here that all the ferries and hydrofoils from the mainland and the neighbouring islands dock.It is also here that all the bus routes on the island begin and end. There are several car hire companies operating in Skiathos Town, offering a range of vehicles from scooters to 4x4 off-road cars. Taxi services are in abundance and will take you anywhere on the island. The airport is just a short distance to the north east of the town and is serviced by flights to Athens all year round. Services to most northern European countries operate between April and October. The main post office for the island is located in Skiathos Town. You can also find several internet cafes in the town. All of the emergency services are based in Skiathos Town as well as the governmental administration departments.